To keep your teeth healthy, strong and looking good, it is important to have good dental hygiene. Your teeth make a dramatic difference to your appearance, so it is important to keep them looking good. Not only are your teeth important for your appearance, it is also important to keep your teeth and gums healthy for your general well-being including speech and eating capabilities. Tooth decay happens when the outer layer of your tooth has been destructed by bacteria and acid in your mouth. Tooth decay can lead to an assortment of dental problems and can lead to cavities, infection and gum disease. It is vital that proper dental hygiene is maintained to avoid tooth decay. Here are some important steps to assist you in maintaining good dental hygiene. As tasty as it is, excess sugar consumption is a leading cause of tooth decay and cavities across the board. Limiting the amount of sugar intake in your diet and ensuring proper dental hygiene after consumption is paramount in avoiding damage to your teeth. Coffee and tea consumption are leading causes of undesirable yellowing of the teeth. To avoid staining, limit excess caffeine consumption and always ensure proper dental hygiene is used. One of the best ways to ensure you keep healthy, strong and attractive teeth is to regularly visit the dentist. The dentist will be able to thoroughly clean your teeth, give an overall check-up and fix any problems that you may have. The dentist will also be able to give you researched information on the best ways to look after your teeth. Further, oral care including whitening teeth products can be recommended by your dentist. Smoking is proven to be a leading cause of tooth decay, cavities and gum disease. Avoiding cigarettes can be the key to a healthy mouth and strong, healthy teeth. Brushing twice a day is vital to maintain strong, clean and healthy teeth. Brushing your teeth is paramount for white teeth and healthy gums and it is vital to start when a child’s first tooth arrives. Until a child can adequately brush their teeth for themselves, it is important that an adult assists. Brushing with a fluoride toothpaste will also assist in adequately removing any plaque that is coating the teeth. Using mouthwash and flossing should be part of your twice a day dental routine. Mouthwash and dental floss assist in removing any leftover bacteria, food and plaque that is left on the teeth after brushing. Having a healthy diet is incredibly important in maintaining healthy teeth and gums. Drinking lots of water and eating healthily will keep your teeth strong and limit the amount of plaque build-up. Food and drink such as milk and nuts assist in keeping plaque at bay and help protect your teeth and gums from damage. Maintaining a healthy diet will also limit the amount of sugar and acids your teeth come into contact with and will help avoid tooth decay and cavities. So remember, adults and children alike need to visit the dentist regularly, maintain a healthy diet, brush and floss twice a day and limit sugar intake. Adults need to avoid smoking and limit caffeine intake, while remaining visual about the care and protection of your teeth. These steps will ensure the next generation grows up with healthy and strong teeth, just as you have. 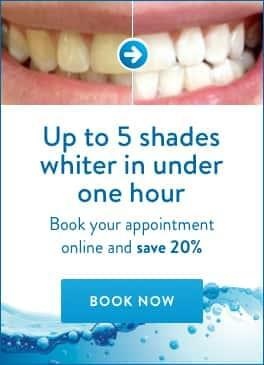 For a better teeth whitening treatment, visit PureSmile Sydney and Brisbane clinics today!